Calan Forcat has three small sandy inlets with platforms for sunbathing, or diving, swimming and snorkelling in the bright translucent waters, but not much of a beach. However, nearby Calan Blanes has a lovely sandy beach lined with palm trees. 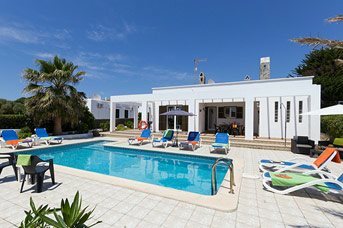 There is an excellent range of shops in the area, including supermarkets if you feel like buying food to eat by the pool in your villa, (although with the choice of restaurants round here you may just decide not to bother cooking!) You are only ten minutes’ drive from the old town of Ciutadella, with an even better selection of shops and authentic Spanish restaurants, and much to explore. The holiday resort is ideal for children, and has a host of activities to keep them entertained. Together, Calan Forcat, Calan Blanes and Los Delfines are the liveliest holiday resorts on the island for nightlife. We are not talking mini- Magaluf here, but there is plenty to keep young fun-seekers happy! Nightlife in Calan Forcat has a distinctly British flavour with Irish pubs, discos and plenty of opportunity to release your inner diva in a Karaoke bar! 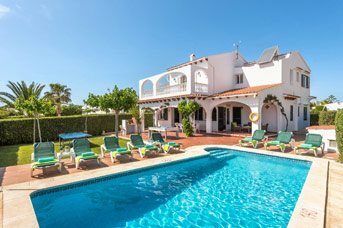 Calan Forcat has a typical Mediterranean climate of long, hot summers and short, mild winters, ideal for a holiday any time of year. 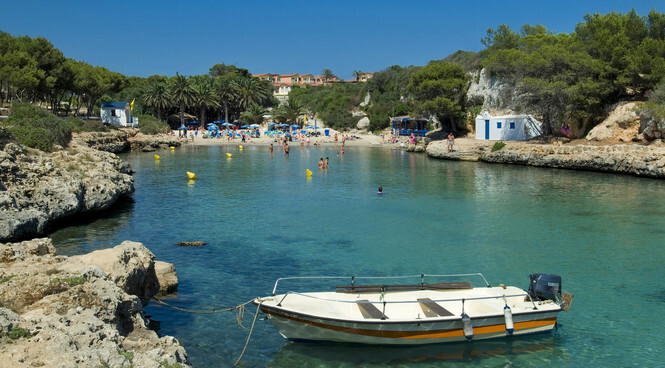 Much of the west coast of Menorca around Calan Forcat is very rocky and rugged, with deep water inlets and lovely sandy coves, but there are lovely, safe, clean, sandy beaches at Calan Blanes, Calas Piques and Cala Brut. 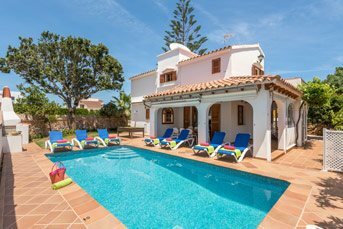 Calan Forcat is just a ten minute drive from Menorca's former capital Cuitadella, with great architecture and a rich and interesting history. You will see elegant palaces that reflect the city’s former glory, and will soon understand why the local name for the city is Vella I Bella, which translates as 'The Old and the Beautiful'. There is a huge Gothic cathedral and many churches and museums to explore. You will find high quality seafood on offer in the restaurants around the harbour and many authentic tapas bars for an evening of drinking and grazing. There’s great shopping here as well!